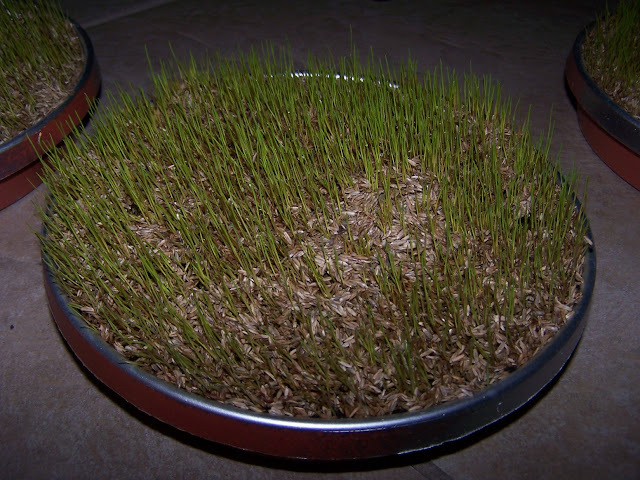 is to grow grass seeds in a container. the end of this post) . would fit inside them for growing purposes. it pushes the soil up (and possibly out of) the container. grass...your garden center could recommend one for you. You don't need a lot of seed per container. Spring to use for Easter decorations. that you can usually buy a small amount of. layer of potting soil on top of the seeds if you want. Water the containers carefully trying not to dislodge the seeds. Be sure the potting soil is wet (but not muddy-wet). Place the container in a warm sunny spot. moisture in and help with the seeds' germination. (sometimes more if I have time and they look dry). In a few days, you will see green sprouts coming up. If you have used saran wrap, take it off now. a window so the grass doesn't grow lop-sided. but still be gentle and DON'T let them dry out. it is at its peak (provided that you keep it watered...it needs it almost everyday since the soil is not very deep). Some folks don't like it this floppy...you can give it a "haircut" with scissors if you want to. This is the final product at the wedding reception in a silver bowl. grass. You could do the same thing with Easter eggs, etc. used, you can see my post More Grass Centerpieces. Thank you for your comment on my blog. Since you didn't have an email to reply to, I am answering your question here. If you go to Martha's website and click on the tv tab, you will see the next week that tickets are available. Select the day and you will receive an email 3 weeks before the date. If you do not receive an email in that 3 week period, time to go back and select the next week available. It isn't hard to get tickets at all. Good luck and come back and visit NY sometime. What a great idea. 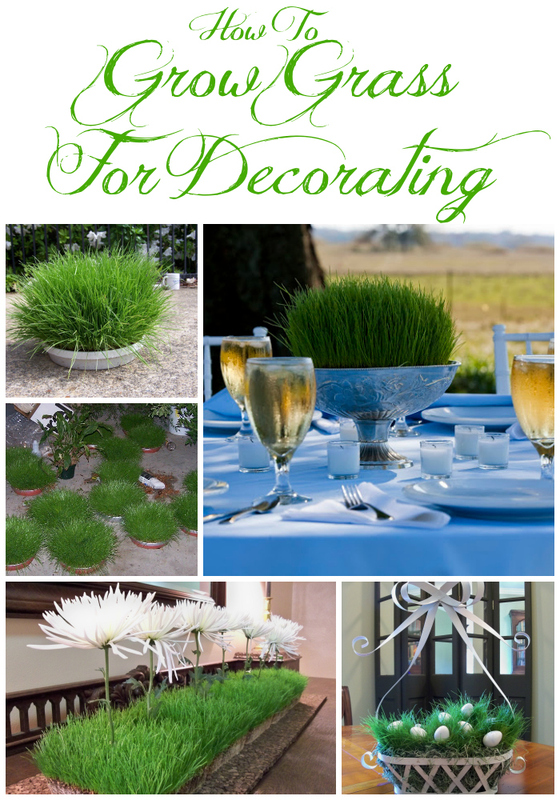 I grew this grass several years ago but now I'm inspired to try it again for a centerpiece. 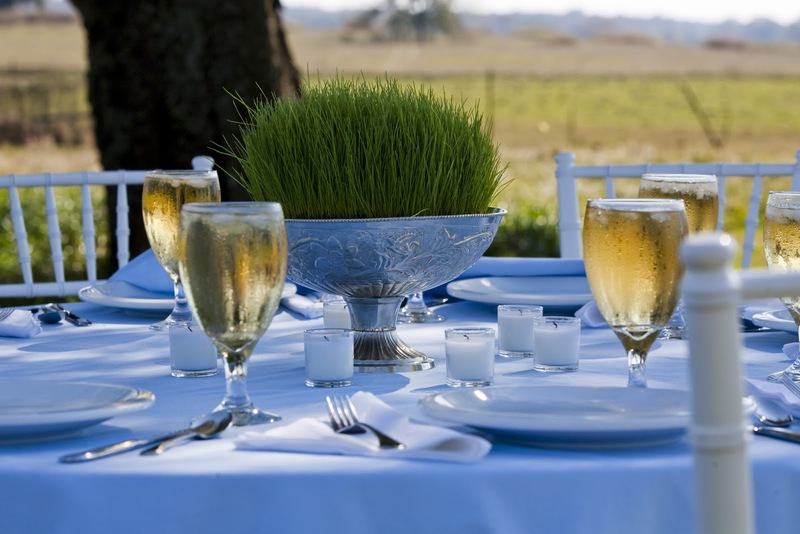 The outdoor table settings are gorgeous. The candy table is very cute. 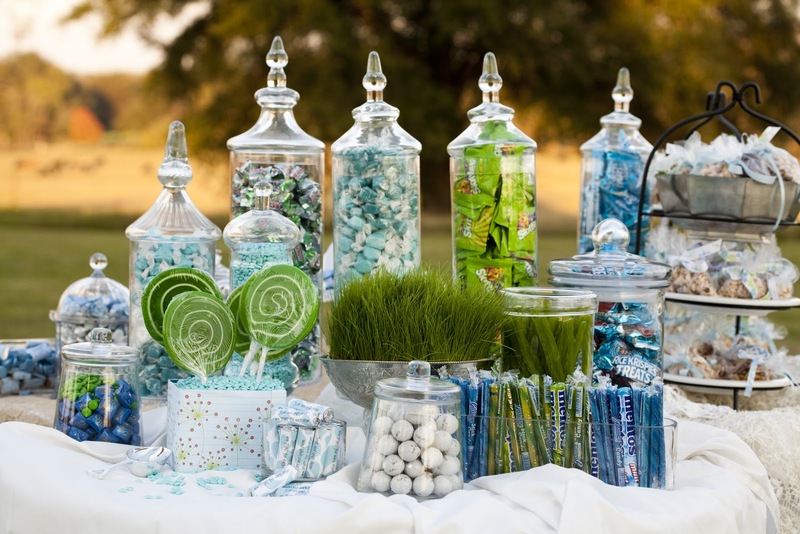 I've recently sold some of my apothecary jars on ETSY for a girls candy bar at her wedding. Tks for stopping by and your nice comments of my auction centerpieces. This is a fabulous "green" idea! It looks awesome! Thanks for stopping by & leaving a comment. I shared this on Twitter & I am your newest follower! I really like this idea! Very cool! 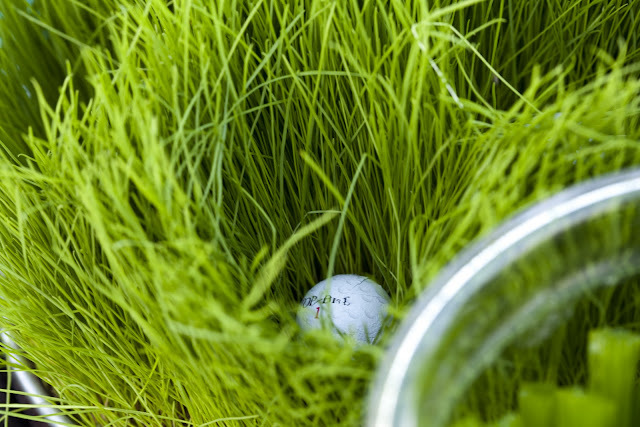 I'm thinking about growing some grass for some centerpieces for a golf benefit. Since we want to use clear, square glass containers, I was wondering how I could hide the dirt. I was thinking I could line the container with moss (facing outward.) I guess I'll just have to try it and post about the results! Very cool...I love it. Nice to meet you and welcome to blogging. Thanks for joining my newbie party. Please add my link or button. Thanks. I love this idea and have always wanted to try it. The wedding reception is beautiful and elegant. I'm visiting from the newbie party although I wasn't able to participate this week. I'm a new follower and look forward to visiting often. I hope you visit me as well. I grow grass one year for my Easter table..loved it, I forgot about it until I seen your post. Thanks for sharing. First time at your blog, I was browsing through blogland and came upon your blog. I'll be back because I'm now a follower. What a wonderful inexpensive center piece! It is elegant at the same time, I love this idea! That is why blogging is so fun, so many ideas! I am visiting from Debbie Doos and and I am your newest follower, hope you will stop by for a visit and follow me back. This is so adorable, I can't wait to see your Easter pieces! Found you at the newbie party, I'm your newest follower. I love the grass centerpiece idea! This may come in handy for me next month as I decorate for our Mother/Daughter banquet! I LOVE this... I did weddings for about 10 years and this is a first! What a unique, whimsical idea. I'm sure this was a big hit. I look forward to many more posts as I'm your newest follower. It was so nice to meet you at the newbie party! I love your ideas! I actually started growing grass in a wooden container on my patio and it looks so cute. Wanna know what's funny? I'm growing it for my cat! Seriously! 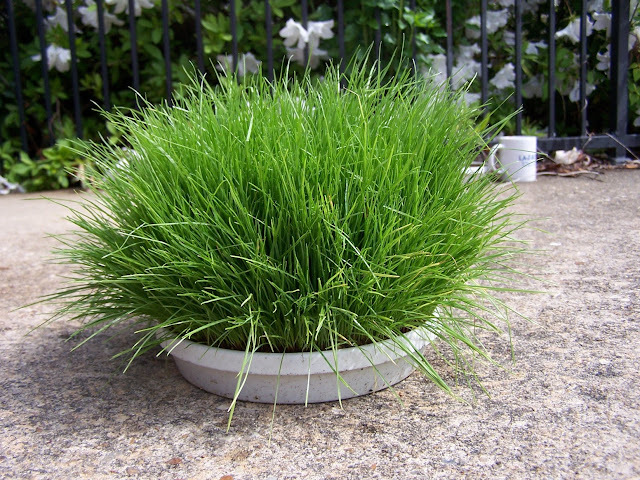 Cats love wheat grass (they call it 'cat grass' at pet stores and charge a lot more for it) and I grow it for her. The box it cute and when I give it a "haircut" I bring in the cut off grass for her to eat! I love grass and i love this idea and actually used fake grass at my wedding for the centerpieces a couple years ago. 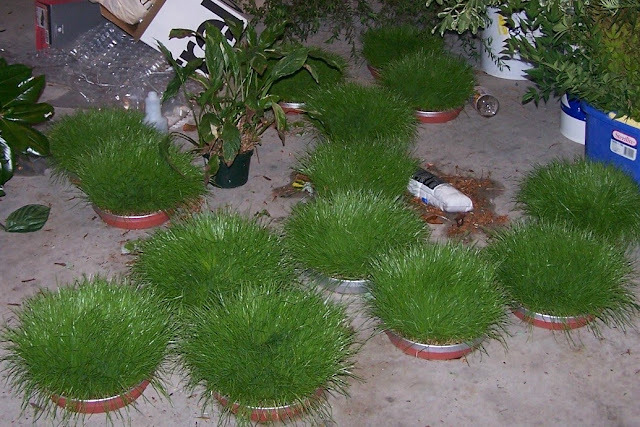 We wanted to grow real grass but didn't have time. All in all in turned out really cute and I love your daughters centerpieces. I'll have to send ya a picture of mine. I am so excited to try this for Easter. 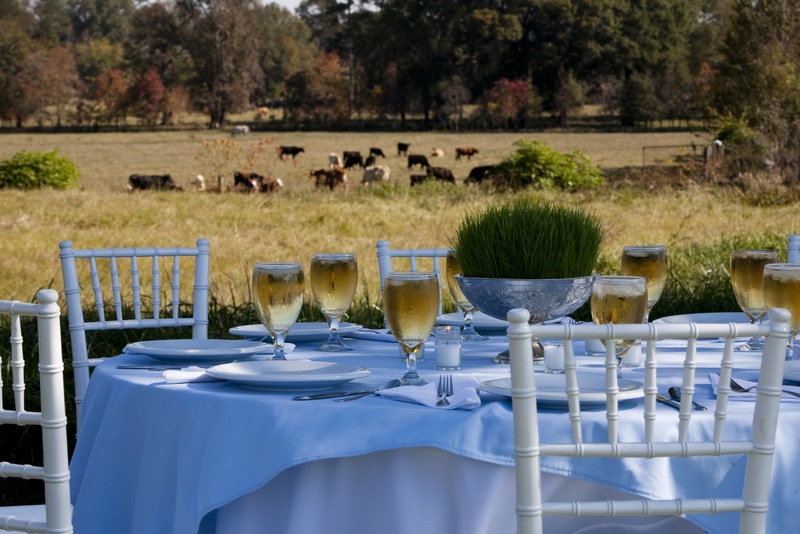 I've always loved when people use grass for centerpieces, etc. and I don't know why it didn't occur to me that I could do it too! :) Thank you! I am so happy I found your post through Pinterest. 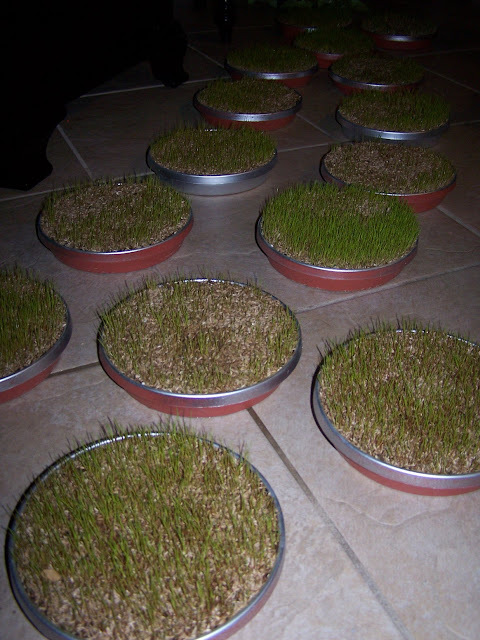 I am interested in making some grass center pieces for a ladybug themed party this March. It is currently cold where I am located, could this still be put on our covered front porch or best to put inside by a window? How early would you recommend starting the process? Three weeks? Thank you! Really happy to read this post, this will be helpful for me. Now I can easily grow the grass for decorating my garden. Keep sharing more posts like this. I really liked your blog, you have shared the new ideas that how can we plant seeds. Really helpful for decorating the garden. Keep giving us updates.